We tried Indonesian Spicy Chicken with Coconut Milk, a recipe downloaded a while ago from the Cooking Asian Food website that now appears to no longer exist. Shallots, cumin seeds, garlic and turmeric are blended into a paste and chicken breasts are cooked in the paste together with kaffir lime leaves, fresh coriander, nutmeg, black pepper, coconut milk and water. We served the chicken with egg noodles, garnished with coriander leaves. 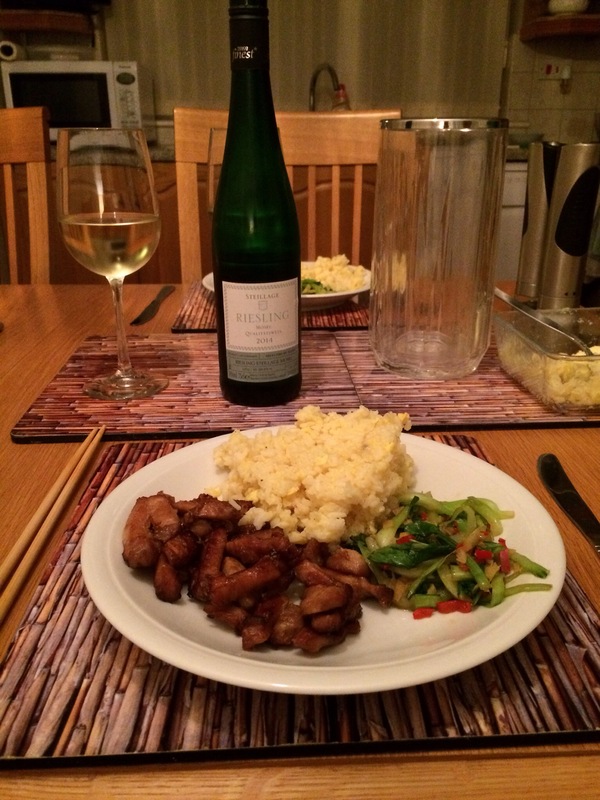 We opened a bottle of Denman Hunter Valley Semillon 2013, an Australian white from Tesco. It was very slightly off-dry, delicately flavoured with zesty citrus and tropical fruit flavours. A good match with the chicken. We enjoyed a family holiday on the Riviera Maya in February and decided to get together with our family and some friends who had also been to the same resort to enjoy a photo evening. We thought a Mexican buffet would be a good idea. 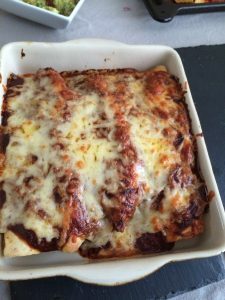 Our son contributed his own delicious version of chicken enchiladas and one of our friends supplied a chilli con carne with dark chocolate in the sauce. Our daughter and son-in-law provided a spectacular nachos, rice, guacamole, pico de gallo and salad. 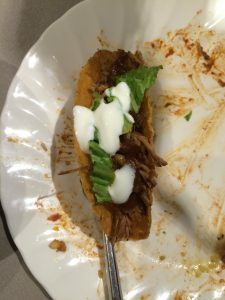 We did Justine Patisson’s pulled pork tacos from the BBC Good Food website. What to drink with such a variety of flavours? 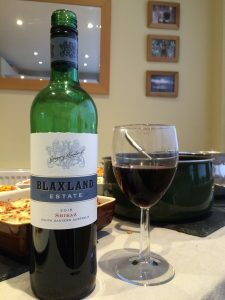 A couple of different Shirazes were on offer, including Blaxland Estate 2015, from Tesco. Those preferring white wine, enjoyed Louis Felipe Edwards Sauvignon Blanc, supplied by our son because it was one of the house whites from our Mexican hotel. There was also Guinness West Indies Porter available as an alternative to wine. With such a variety of flavours it was impossible to find something that paired well with everything, especially with dishes like the pork tacos that contained marked sweetness. My preference was Shiraz, but the porter was also popular. Overall, a buffet with such diverse flavours is probably not the best occasion to bring out the fine wines. 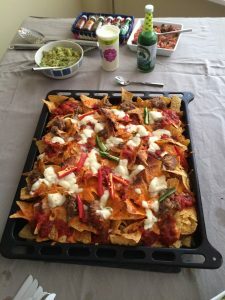 Posted on March 25, 2016 May 3, 2016 Categories Fruity, Red Wine, UncategorizedTags Australian Red, Beef, Chicken, Chilean White, Mexican, Pork, Sauvignon blanc, Shiraz, Stout, TescoLeave a comment on Which Drink Pairings for a Mexican Buffet? We tried a couple of Beef Wellingtons from Bakers of Nailsea, our local butcher and we watched them being prepared in the shop. 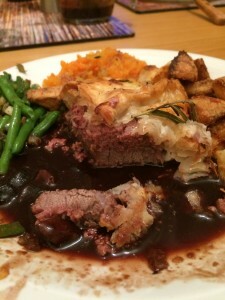 A fillet steak is placed on a sheet of pastry and pâté with duxelles is spread over it. The steak is then wrapped in the pastry. OK not the most sophisticated Wellington, but all we needed to do was pop them in the oven for an easy meal. We served with sautéed potatoes and green beans tossed in garlic butter and lemon juice. Our wine choice was a bottle of H. Valrasque Châteauneuf-du-Pape 2014, a full-bodied French red blend from Tesco. We detected black fruits on the nose, with red and black fruits on the palate and a hint of spice and chocolate on the finish. 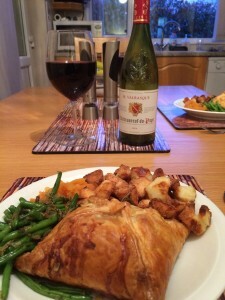 Probably not the best example of a Châteauneuf-du-Pape, but still a very good match with the Beef Wellington. 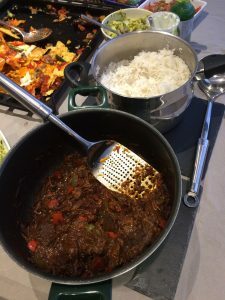 We tried Madhur Jaffrey’s version of Beef and Potato Massaman Curry, a Thai dish. Pieces of beef skirt are fried with coconut cream, bay leaf and Massaman curry paste, which is made from red chillies, white peppercorns, cumin seeds, coriander seeds, cinnamon, shallots, lemongrass, garlic, ginger, curry powder and shrimp paste. Fish sauce, tamarind, palm sugar, potatoes and water are then added and the curry is simmered. Fried shallots are sprinkled over before serving. We attempted to pair the meal with a bottle of Villa Maria Marlborough Sauvignon Blanc 2014, a New Zealand white from Costco. However, more sweetness was needed, so we set it aside in favour of a bottle of Awatere Pinot Grigio 2013, an off-dry New Zealand white from Tesco. We tasted tropical fruits with a pineapple sweetness and grapefruit sharpness. This wine was a reasonably good match with the food. We tried a bottle of Houghton Margaret River Sauvignon Blanc Semillon 2013, an Australian white from Costco, with the leftovers a couple of days later and thought this was also a good match. See here for a another good food pairing for this wine. 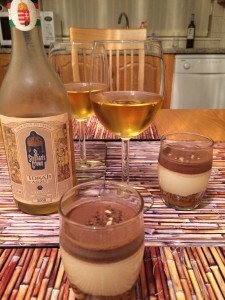 We don’t drink many dessert wines, not least because we rarely eat desserts unless we are entertaining guests. However, we had some ready-made desserts in the fridge and a dessert wine we wanted to try. We had managed to buy a 50cl bottle of St Stephans Crown Tokaji 2008, 5 Puttonyos Hungarian sweet white dessert wine at a very reasonable price from Tesco. Hungarian Tokaji is viewed by many as an aristocrat among sweet wines. First up was a Delici sea salt caramel Belgian dessert from Costco. The packaging describes the dessert as a “delicate blend of crushed speculoos cookies and fleur de sel caramel, topped with an intense cream caramel mousse and finished with a dark chocolate ganache.” Very tasty. The second dessert was a Gü maple and pecan pie from Tesco. This is described as “a crumbly pecan biscuit base, topped with a creamy maple syrup-infused cheesecake.” Another enjoyable dessert. Now for the wine. We found it honeyed with burnt caramel, woodiness and a sweet smoothness. However, it was not overly sweet. A lovely wine. Whilst we thought the wine was a good match with the sea salt caramel dessert, it was better with the maple and pecan pie. We made pulled pork fajitas by loading some tortilla wraps with Tesco‘s BBQ pulled pork, which is slow cooked pork shoulder with a BBQ glaze and a hickory BBQ sauce. We then added grated Cheddar, guacamole, sour cream and shredded lettuce. Tasty. 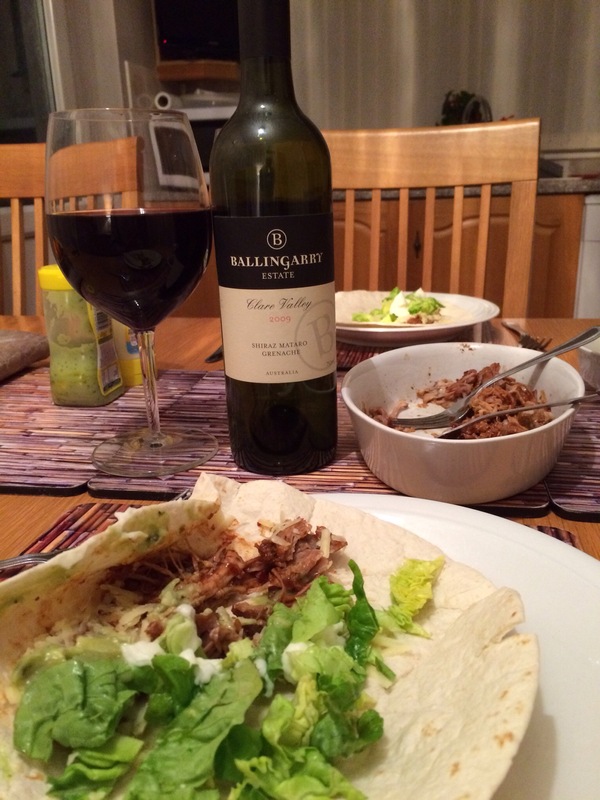 We opened a bottle of Ballingarry Estate, Clare Valley Shiraz/Mataro/Grenache 2009 from the Sunday Times Wine Club. This wine was a lovely inky black in the glass. We detected black fruits on the nose, followed by an initially sweet palate, spicy black fruits and a long chocolaty finish. A moreish wine and a very good match with the fajitas. hoisin sauce. The pork is then roasted. soy sauce and sesame oil. 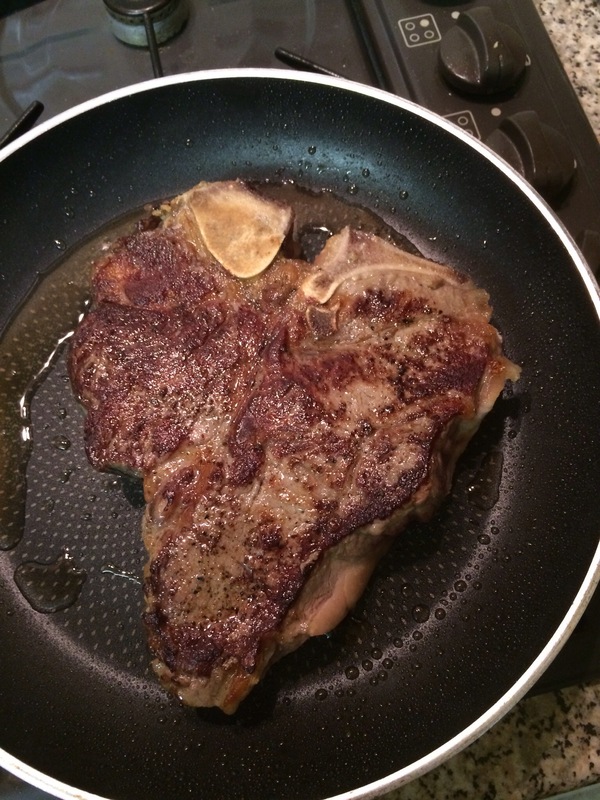 We bought a lovely T-Bone steak from our local butcher Bakers of Nailsea. We pan-fried the steak and served it with chips, Parmesan tomatoes and mushrooms, together with parsley butter and Dijon mustard. 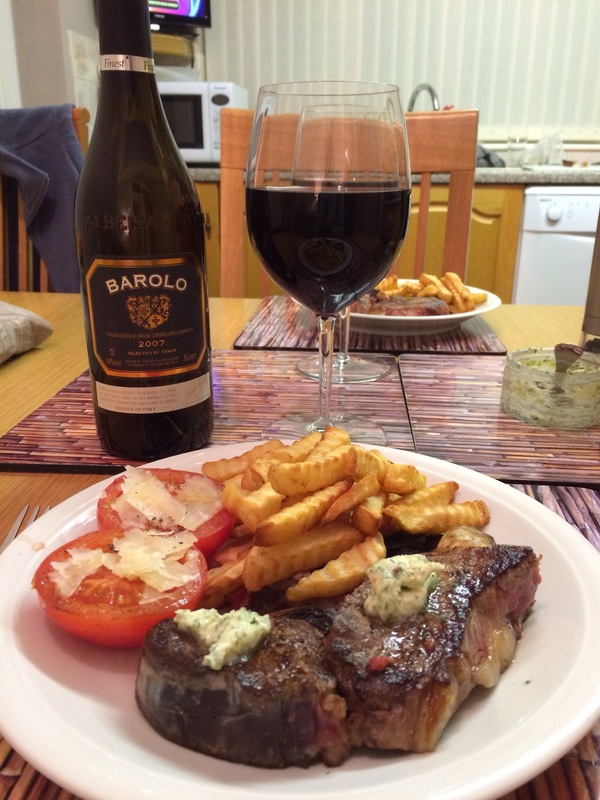 We enjoyed the steak with a bottle of Tesco‘s Finest Barolo 2007. This powerful Italian red made from the Nebbiolo grape delivered sweet plums on the nose, flavours of sweet vanilla, followed by earthy savouriness, red fruits and subtle spiciness. An excellent match with the steak. We were looking for a recipe for some aubergines we had been given and decided on Rick Stein’s Aubergine Curry with Tomatoes, Ginger and Fennel Seeds. This dish is from Bangladesh and the aubergines are cooked in a curry made from ginger, garlic, green chillies, cumin, fennel seeds, coriander, turmeric, tomatoes, salt and pepper. The dish is garnished with fresh coriander and mint. We served this very tasty curry with pulao rice. 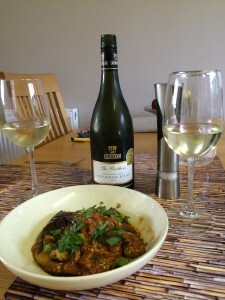 We paired the curry with a bottle of Giesen The Brothers Marlborough Sauvignon Blanc 2011, a New Zealand white from Tesco. 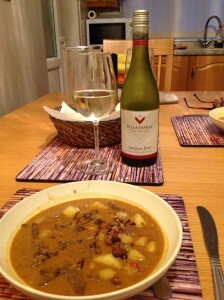 We thought the flavours were somewhat muted for a New Zealand Sauvignon, but we thought the pairing with the curry was good. It brought the wine’s grapefruit and tropical fruit flavours to the fore. 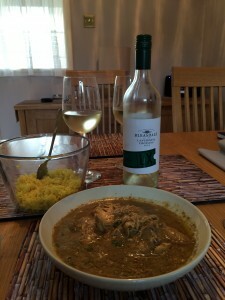 Last month we cooked Caribbean Peanut Chicken and particularly enjoyed the peanut butter flavours. We were entertaining guests and fancied trying another recipe with similar ingredients and chose Peanut Butter Chicken Stew from Supercook. This is a West African dish that we served with boiled rice and sweet potato. Chicken pieces are cooked with onion and a paste made from chicken stock, salt, pepper, turmeric, coriander, cumin and chilli powder. Tomatoes are added later and the dish is garnished with parsley. Delicious and even better than the previous recipe. 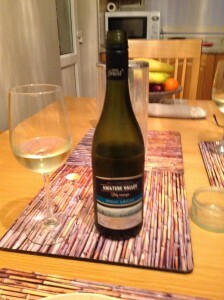 We opened a couple of wines to pair with the meal – Lions Gate Sauvignon Blanc/Semillon 2011, a South African white blend from Tesco and Wairau Cove Sauvignon Blanc 2013, a New Zealand white also from Tesco. Both these wines went well with the meal, with the New Zealand wine having the edge. We had the leftovers with a bottle of Bleasdale Langhorne Crossing Verdelho/Sauvignon Blanc 2014, an Australian white blend from the Wine Society. This was crisp, fresh, slightly off-dry with grapefruit and tropical fruit flavours. The wine was a good match with the chicken.